Doughton Park, located between milepost 238 and 246, is the largest recreation area along the 469 mile Blue Ridge Parkway. It also happens to be one of the most spectacular locations to soak up fall color changes in the area. It’s easy enough to stop at a lookout along the BRP and get the view you came for at Doughton — the scenic highway follows the ridge at the top of the park, putting you in a perfect position to peruse the panorama. But to get fully immersed in the landscape, walking some of the 30 miles of trails is the way to go. The trail system at Doughton is pretty simple. The longest trek runs for about 16.5 miles and creates a ring around the entire park. If time allows, this is the best way to experience all the amazing views the park has to offer. To make the walk a little easier and more in line with a day-hike time budget, use the trails that cut through the center of the park. The Grassy Gap fire road links to the Bluff Ridge primitive trail. Bluff Ridge is 2.8 miles of nearly straight uphill climbing, terminating on the Blue Ridge Parkway. A shelter sits right near the end of the trail and is a great place for lunch with a view. While hiking is the main attraction, Doughton Park also offers some other amenities. The campground holds 60+ tent sites and 25 RV sites. Rainbow and brook trout can be found swimming in Basin Cove Creek, just waiting for skilled anglers. And cross country skiing is allowed when the park is accessible in winter (even when other parts of the BRP are closed). Back in the day, the late 1800’s that is, the area was home to the bustling Basin Cove community. In 1916, however, a flood claimed most of the structures in the area. Two notable survivors are the Brinegar Cabin (circa 1885) and the Caudill Family Homestead. Both are accessible by trail and offer a glimpse into how this very tough breed of settlers once spent their days. Luckily you don’t have to work nearly as hard as the Caudill’s to get your dinner. Once you’ve finished stuffing your eyes with panoramic scenery, it’s time to stuff your belly with some classic Carolina feed. Featured on BBQ with Bobby Flay, the Brushy Mountain Smokehouse and Creamery is the perfect place to help you balance out all the calories you burned at Doughton. Pulled pork is the star of the show, but this North Wilkesboro eatery also offers ribs, chicken, country ham, fish and a whole pile of other choices including their signature side dish, Brushy Mountain Caviar. Saving room for dessert is a requirement. As the name suggests, Brushy Mountain makes their own ice cream which is then generously applied to shakes, sundaes, and cakes. 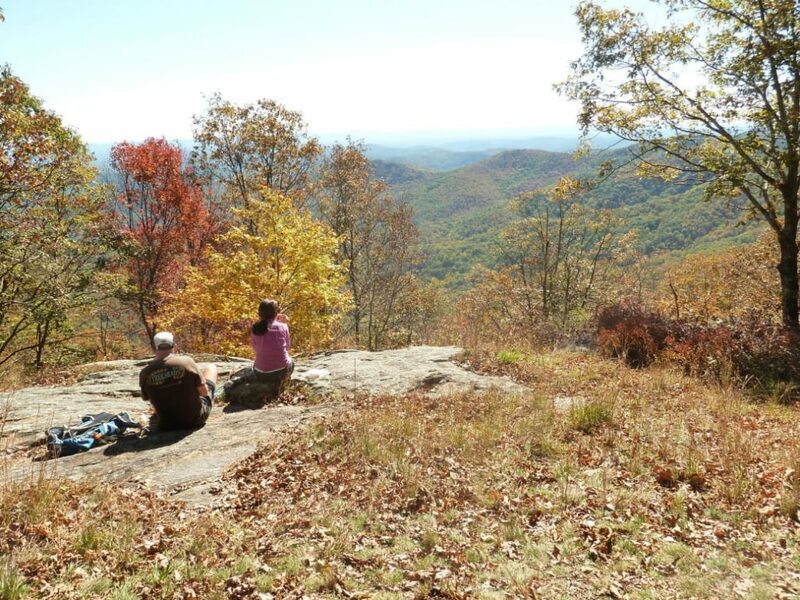 If you want a peek at peak Blue Ridge leaf season from the top of a peak, then Doughton Park in late October and early November is where you need to be.